LIP INK® Liquid Lip Liner In 11 exciting colors, a variety of colors to outline, enhance, and define your lips - with our ultra-durable patented formula. Our LIQUID LIP LINERS can be used SYNERGISTICALLY with any of our LIP INK® COLORS to contrast and define your lip line. LIP INK® LIQUID LIP LINERS can also be used by themselves. 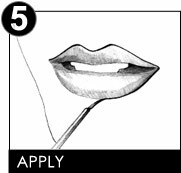 Always begin by purifying the lips using LIP-INK Off Conditioning Remover then splash with water and pat dry with a soft cloth or a cotton pad and gently dab lips (never scrub). 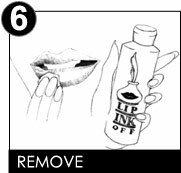 This will remove any remaining lip products or residue from your lips, as foreign matter will interfere with the performance of LIP-INK Cosmetics. 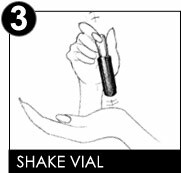 Shake the vial of LIP-INK Lip Liner against the palm of your hand, until the beads move freely. Hold lips in a slightly open yet natural position. Do not stretch or pucker. Because of the quick drying nature of the product, the liner should be applied on your lips in quarterly sections. 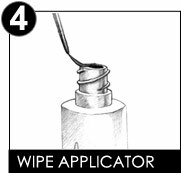 Remove LIP-INK Liner by applying the OFF solution to a cotton ball, make-up pad or a warm, lightly moistened, dark colored wash cloth. Press to the lips allowing a few seconds for the OFF solution to break down the pigment. Gently dab the lips (never scrub) to wipe away the finish, flipping the pad, or cloth as you do so. After color is removed, splash lips with water and pat dry. NOTE: LIP INK® products may tingle, this reaction is normal. The sensation is due to the natural herbs and botanicals. 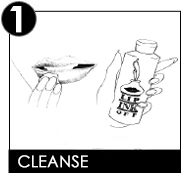 Remember to open the vials carefully, as LIP INK®'s formulas are LIQUID. They can spill, or splatter and when in contact with clothing, carpet, etc. may stain. The LIP INK® wax free, guaranteed smearproof & long-lasting, multi-patented color product line is not compatible with any other cosmetic products. LIP INK® Color Cosmetics are based on scientific research and are protected by U.S. and International patents. Competitive products cannot legally duplicate LIP INK® Color Cosmetics and their precise chemistry. New customers should start with a kit when purchasing any of our guaranteed smearproof color. With regular lipstick it is common to get it on your teeth. You are unaware of it until somebody tells you. Personally I have found it to be embarrassing and gross. With your smear proof liquid lipstick I don't have to worry about that... it's never going to be on my teeth. I love that! Thank you so much for creating a product that makes it easier for a woman to be a flawless woman! My lip liner stays on about a day. I like the way it stains and looks. Thank you! I’ve purchased these products for over a decade and I wouldn’t use anything else! Excellent quality!